Hosta is a staple in many yards because they require little maintenance and are unaffected by cold weather. It’s hard to believe we are almost to the end of the fall season. As we move closer into the dormant season, various forms of plant life are going to start to disappear. This is because the cold weather is not tolerable for many species of plants. 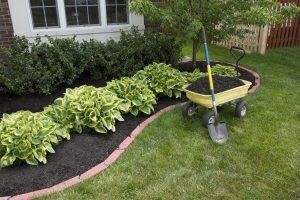 Many homeowners are under the misconception that you can’t plant anything this time of the year. With that said, here are a few plants you can plant before the ground freezes! The best time of the year to plant pansies is during the fall months. This is because the ground is still warm enough for the roots to grow and develop. Make sure that you are keeping the soil moist by watering them on a regular basis. Did you know that several species of vegetables thrive during the colder parts of the year? Some of which include carrots, lettuce, spinach, kale, brussel sprouts, radishes, and rutabaga. Fall is a great time to plant trees and shrubs in your yard. This is because the soil has cooled off slightly and is excellent for root development. If you decide to plant a tree or shrub in your yard this fall, you keep it watered until the ground freezes. This will help with root development and help them get off to a strong start. An annual is a plant species that completes its entire life cycle within one growing season. In most cases, it takes place from the spring to fall months. Here are a few examples of annuals. Both these round plants have been hybridized and consist of rosy and white colors. For this reason, many believe they look more like flowers than vegetables. The leaf margins on ornamental cabbage are rather smooth, whereas flowering kale consists of fringed leaf margins. Ornamental cabbage and flowering kale can be planted in full sun and partial shade locations. Many people do not realize that perennials can be planted during the fall months. This is especially the case for those with large root balls. It is important to note that any perennial should be watered until the ground freezes over. This will help strengthen the roots. Ideally, you want to provide your perennials at least an inch of water every week. However, you do not want to overwater them. Here are just a couple examples of perennials you can plant during the fall months. Available in all sorts of colors, peonies are a beautiful species of flowers that can withstand harsh winter weather. They can be planted and transplanted during the fall months. It is important that you don’t plant them too deep in the ground. If you do, it will make it difficult for them to blossom when spring rolls around. This type of plant thrives in the shade. They are a staple in many yards because they require little maintenance and are unaffected by cold weather. In most cases, they continue to grow every single year. If a hosta ever gets too big, it can easily be divided up and replanted. This entry was posted on Wednesday, November 1st, 2017 at 12:47 pm. Both comments and pings are currently closed.